Creamy Roasted Tomato Soup is full of caramelized, fresh sweet tomatoes which provide a rich tomato flavor. This healthy oven-roasted tomato soup is the epitome of comfort food and, combined with a crispy grilled cheese sandwich, well it just doesn’t get any better. I have tried a number of homemade tomato soup recipes over the years. And, while I have enjoyed pretty much all of them, I do think this is the best tomato soup recipe so far using fresh tomatoes. In fact, we like it so much I have made it twice this week. Soup is the ultimate one-pot meal, it is easy to prepare, can be made ahead, and it is the perfect dish to warm you up on a cold, damp winter day. Plus it’s hard to go wrong with roasted vegetables. Now, I do have to confess that while much of the country has endured brutal winter weather, it has been relatively mild in North Florida. I don’t think we have even dipped below freezing yet and our weather forecast calls for continued mild weather at least for the next two weeks. 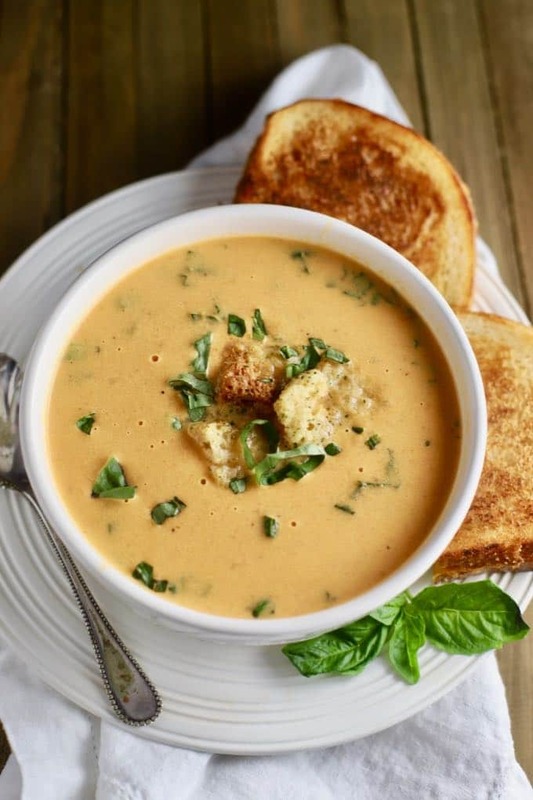 Still, cold weather or not, this creamy roasted tomato soup makes a tasty, quick, light and healthy weeknight dinner or lunch. It’s hands down a much better alternative to canned tomato soup! Core the tomatoes and cut them into quarters. If very large, cut them into eighths. 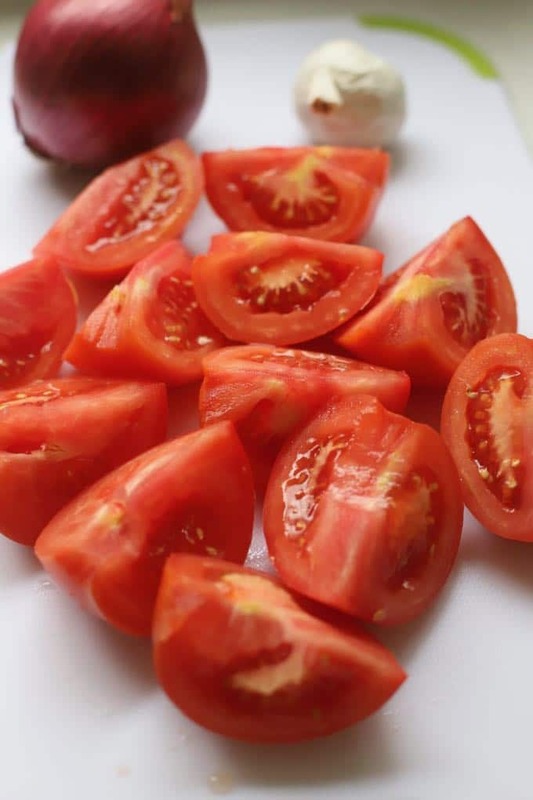 Place the tomatoes, onion, and garlic in a large bowl and add the olive oil. Toss until all surfaces are coated in olive oil. Pour out on a rimmed baking sheet and roast the vegetables for 25 minutes. Stir once after about 15 minutes. 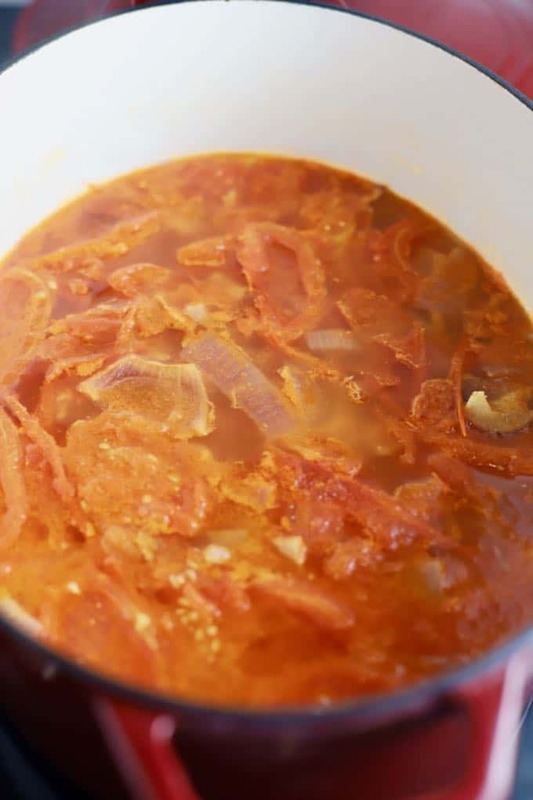 While the tomatoes are roasting, chop up the bacon and place it in a Dutch oven or large saucepan over medium-low heat. Cook the bacon until it is almost done and the fat has rendered. Add the roasted vegetables and any juices and stir to combine. Add the chicken stock and bring to a boil. Reduce the heat to low and simmer covered for 15 minutes. Add the tomato paste and simmer covered for another 15 minutes. 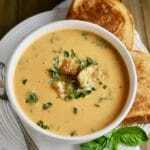 Remove the soup from the heat and use an immersion blender to puree the soup until it is smooth and creamy. Add the cream, basil, salt, and pepper and stir to combine. Taste and add more salt and pepper to taste. Optional, garnish with a few croutons and additional chopped basil. Serve hot. Leftover soup can be stored covered in the refrigerator for several days. If making ahead, make the soup up to the point of adding the tomato paste and store covered in the refrigerator for several days. Before serving, add the cream, basil, salt, and pepper. Heat over medium heat until hot and serve. Since this recipe only calls for three tablespoons of tomato paste, you might want to consider purchasing it in a tube instead of a can. With a tube of tomato paste, you can just use the amount you need, then store the rest in the refrigerator until you need it again. No more cans of half-used tomato paste lurking in the back of your refrigerator. Instead of buying chicken stock in a box, I like and recommend jarred Better Than Boullion Reduced Sodium Roasted Chicken Base. You can find it next to regular chicken stock. No, this is not a sponsored post. I just like the convenience of using this product and making just the amount of chicken stock I need. If you don’t have an immersion blender, you can use a regular blender to puree the soup. You will have to do it in batches and be sure to place a dish towel over the lid to prevent any hot liquid or steam from escaping. Creamy Roasted Tomato Soup is full of caramelized, fresh sweet tomatoes which provide a rich tomato flavor. This healthy oven-roasted tomato soup is the epitome of comfort food and, combined with a crispy grilled cheese sandwich, well it just doesn't get any better. 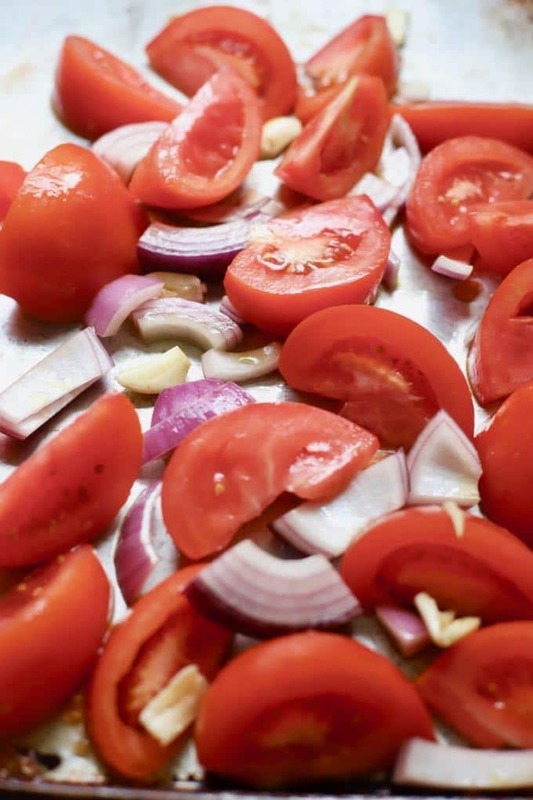 Place the tomatoes, onion, and garlic in a large bowl and add the olive oil. Toss until all surfaces are coated in oil. Pour out on a rimmed baking sheet and roast the vegetables for 25 minutes. Stir once after about 15 minutes. 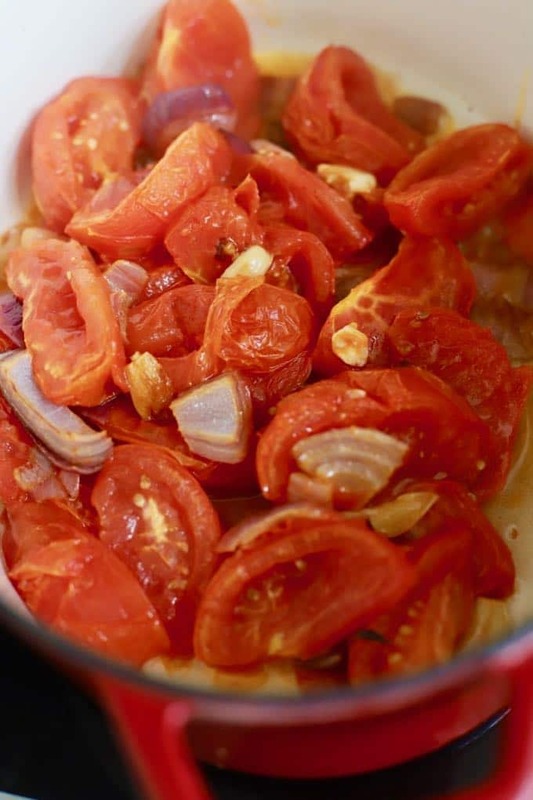 While the tomatoes are roasting, chop up the bacon and place it in a Dutch oven or large saucepan over medium-low heat. 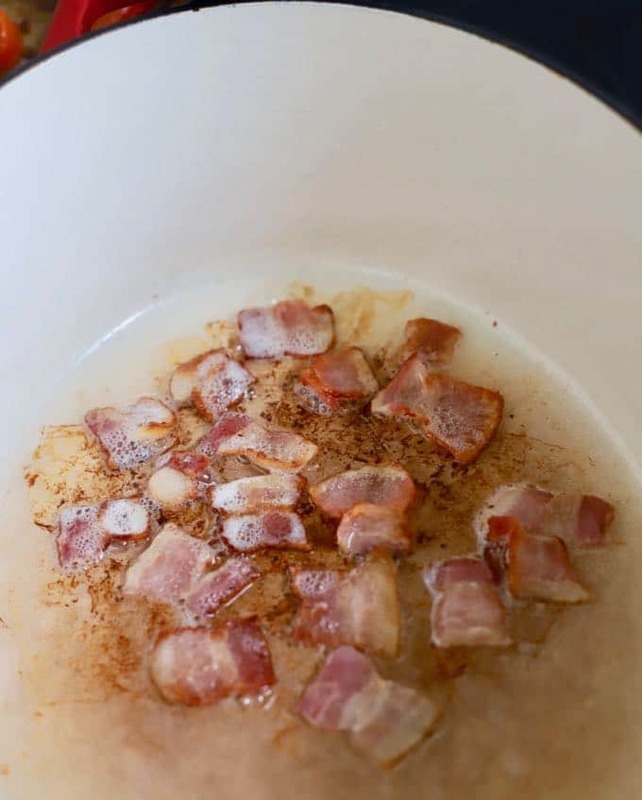 Cook the bacon until it is almost done, and the fat has rendered. Add the roasted vegetables and any juices and stir to combine. Instead of buying chicken stock in a box, I like and recommend jarred Better Than Bouillon Reduced Sodium Roasted Chicken Base. You can find it next to regular chicken stock. No, this is not a sponsored post. I just like the convenience of using this product and making just the amount of chicken stock I need. And, I think you will too! 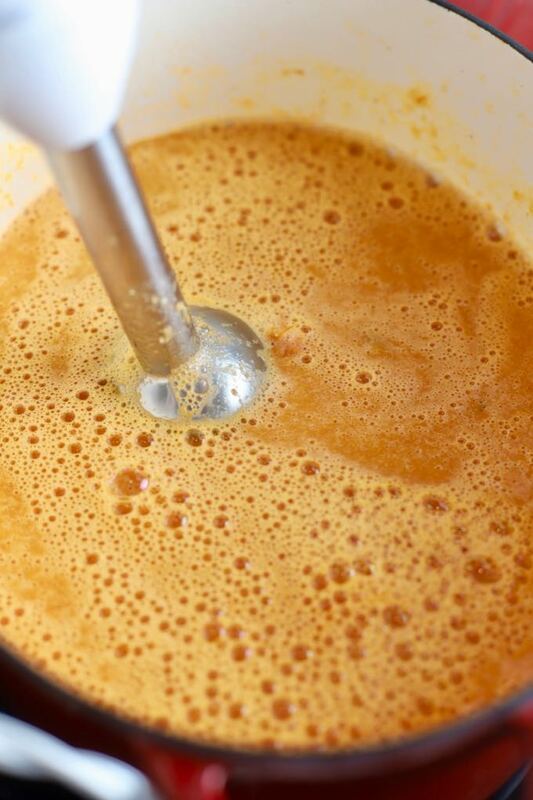 If you don't have an immersion blender, you can use a regular blender to puree the soup. You will have to do it in batches and be sure to place a dish towel over the lid to prevent any hot liquid or steam from escaping. Any recipe that has “creamy,” “roasted,” and “tomato” is definitely a hit in my book. Just looking at your photos has made my mouth water. 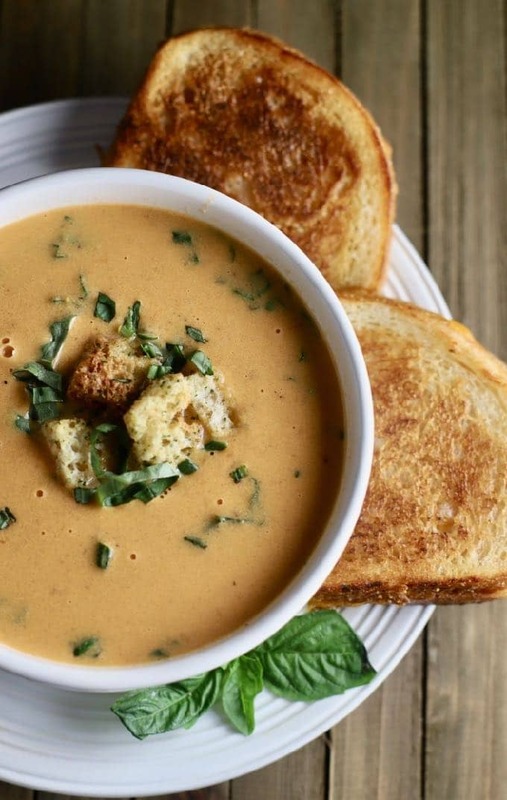 This wintery soup idea has my soul all warm and cozy. Thanks so much for your posts! The recipe does not indicate how much garlic to use. Yikes! Oh, Robert, I am so sorry! This recipe calls for 5 whole cloves of garlic and I have added it to the recipe. Of course, you can use more or less depending on how much you like garlic. Thank you so much for letting me know!